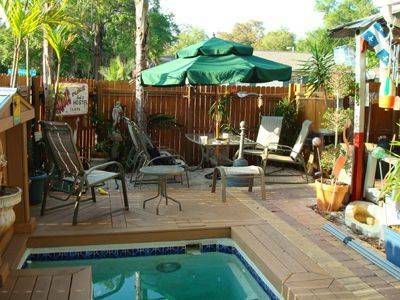 Tampa Florida's Only Alternative/Adventure Lodging with Clean, Quiet, Restful MUSIC THEMED Rooms and a simulated RAILROAD Station Depot and Sleeper Car, Small pool and BYOB Bar in our courtyards. All Rooms are themed after a style of music: (A Total of 8 Rooms) Old time window panes were selected to portray the music greats of that music style in the rooms. 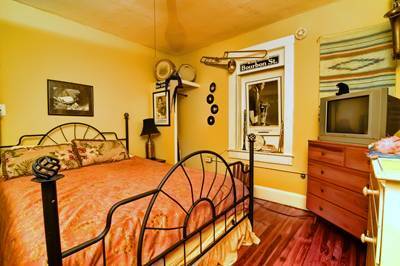 Each room has a special cassette tape so you can hear who is portrayed on the walls and a book on that style of music. Each room has it's own comment book to read comments left by other guests and you may leave comments for future guests. Real musical instruments from Guitars, Fiddles (Violins), Saxophone, Trombone, Trumpet, Drums , Clarinet, Washboards etc. line the walls of these very interesting rooms. 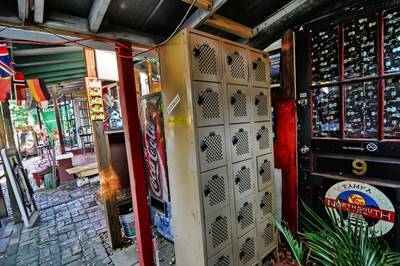 A cozy outside BYOB bar (Parsons Pub) adjacent to a small pool with sunning decks. contentedly... and the strains of Jazz, Blues, Folk (Celtic), Country, Rock & Roll, Big Band, Reggae, Classical, Etc... fills the air. 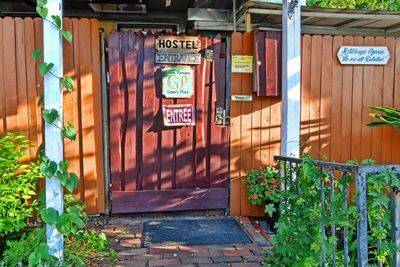 Search for "Gram's Place Hostel Tampa"
Private Bath Rooms Are: 1. The Jazz Room: #6 (One Queen size bed) 2. The Blues Room: #7 (Bunk Bed: sleeps 1-2 on bottom + 1 on top) 3. The Rock & Roll Room: #8 (One Queen size bed) All private rooms (above) have Telephone, A/C, Cable TV and Sony A/M F/M Cassette stereo Radio & Hard Wood Floors. The rooms with a private bath share the "I love Lucy Kitchen ". 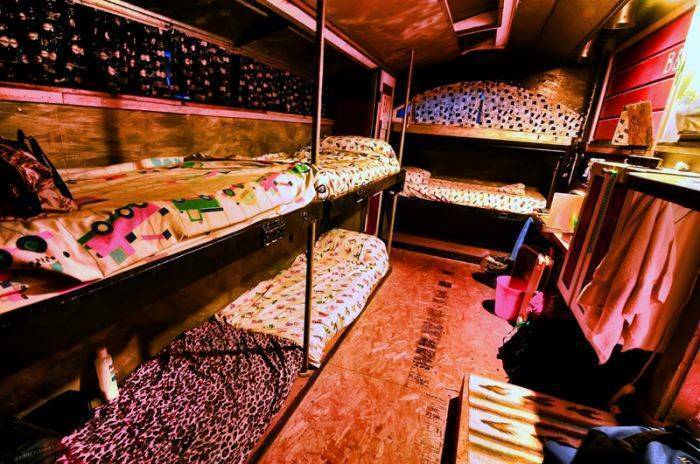 Shared Bath Rooms Are: The Train Room (a simulated sleeper car) is our Coed Dorm and sleeps 6. 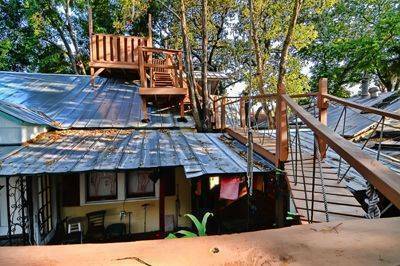 It has a Private Sink in room & shares a Kitchen. NOTE: Tax of 12% is not included in the price. Must cancel 3 days before arrival to not be charged for full amount. One mile north of downtown Tampa. 3 blocks past Floribraska ave to Plymouth st.
Go left 3 blocks to Ola. We are on the corner of Ola ave and Plymouth st.